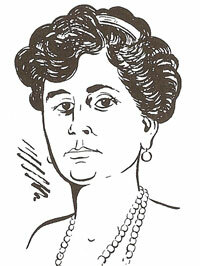 Mary Garden gained renown as an opera star in both America and Europe. She was famous for her impersonations of characters like Melisande, Marguerite, Thais, Sappho and Griselidis. ■ She rose rapidly in her field and was recognized as one of the greatest singing actresses of her time. She was adored in Chicago and acclaimed throughout America and Europe. ■ Mary Garden was born in Aberdeen, Scotland, on February 20, 1877. When she was six years old her parents emigrated to America settling in Chicopee, Massachusetts, and Hartford, Connecticut. In 1888 the family moved to Chicago where Mary learned to play the violin. At age 12 she was playing in concerts. She later studied piano and in 1896 went to Paris to further her musical education. ■ In Paris she studied voice under some of the great contemporary teachers like Travadello and Chevalier. On April 13, 1900, when the leading singer in Charpentier's Louise suddenly became ill during a performance at the Opera Comique, Mary Garden was sent on stage as a substitute. She continued in the role for more than 100 performances. She went on to perform in Brussels and London. ■ She returned to the U.S. in 1907 to make her American debut in New York in Thais. Returning to Chicago in 1910, she appeared in the title role of Salome and until 1931 performed with the Chicago Grand Opera Company. ■ Miss Garden was warmly received in tours of 40 American cities (1949-54) accompanied by conductors Bruno Walter and Rudolf Bing. She also appeared at the Edinburgh Music Festival. She retired to Aberdeen, wrote her autobiography, The Mary Garden Story, and died there January 3, 1967.